Brett Stachler, graduate assistant at the Gender and Sexuality Resource Center, speaks about the Resource Center’s recent changes. The Resource Center had a grand reopening Friday on the third floor of the Norris University Center. The Gender and Sexuality Resource Center held a grand re-opening at Norris University Center on Friday. 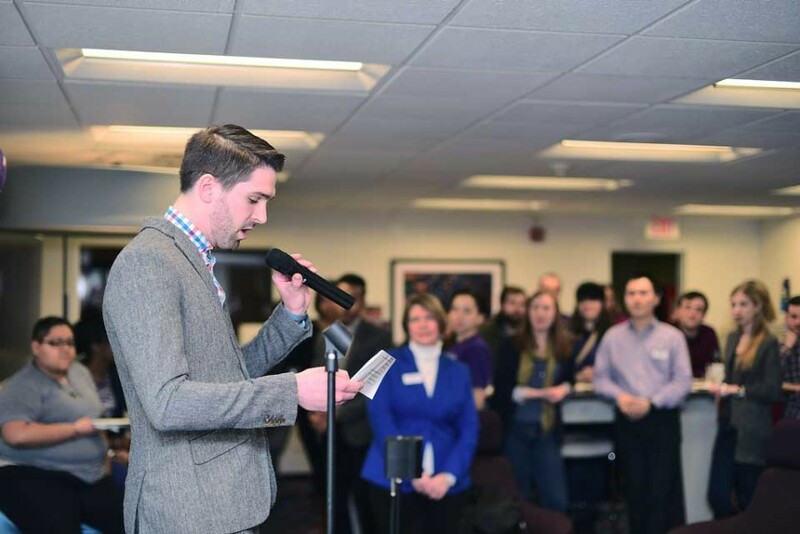 The Resource Center decided to have the reopening just one year after it celebrated its 10-year anniversary to acknowledge significant changes the center has undergone in the past year, said Brett Stachler, graduate assistant at the Resource Center. Over 70 students and faculty attended to hear spoken word poetry about love and inclusion, and to do art projects in the Student Organization Resource Center. The event was put together with help from students and the Center for Student Involvement. “It’s just to let the campus know that we’re still here and to let them know about the name change from the LGBT Resource Center,” Stachler said. At other universities, the term LGBT is standard, but it no longer encompasses the full range of sexualities, Stachler said. He said the name “Gender and Sexuality” is more inclusive. The resource center also celebrated its expanded space within Norris, which was created so it can have more room for events and for students to work, Stachler said. Stachler said the reopening was also held to celebrate the addition of gender-open bathrooms on the second and third floors of Norris. “It’s meant to be a safe space for all genders to use the restroom,” Stachler said. Weinberg sophomores Stephen Rhode and Mahalia Sobhani gave spoken word poetry performances. In Sobhani’s performance, she spoke about love and romance, which seemed perfect for Valentine’s Day, she said. Following the spoken word performances, audience members were invited to an open mic to read poetry that spoke to issues relating to sexuality and inclusion. The resource center is also continuing its search for a new director, which will continue until April. Devin Moss, the previous director of the Resource Center, left last summer. Stachler said the center is looking for someone who will work to create a community for all student voices.